Early last year I remember laughing when I heard people saying Obama was the antichrist, but after hearing it again and again from different people I finally asked the Lord about it. When I did He immediately showed me a vision, which I shared in my previous post, Obama Taking Action Against the Strongest of Fortresses. The vision was based on Daniel 11:39, which states, “He will take action against the strongest of fortresses with the help of a foreign god.” Daniel was describing the actions of the antichrist, who would come at the time of the end, which happens to be now. Despite seeing it in the vision and in the scriptures, I still had a hard time believing it. So I kept quiet about it for six months. During that time, the Lord sent me confirmation after confirmation until finally my faith grew to the point where I was willing to share it. That was when I finally shared the post linked above. Just a few weeks later, the Lord gave me another giant confirmation with a detailed dream revealing again Obama is the antichrist. Today I have documented over one hundred confirmations and the list keeps growing. The strongest of fortresses today is the United States of America. The foreign god is Allah, the false god of Islam. We are seeing the fulfillment of this scripture as President Obama is conspiring with Muslim psychopaths to first infiltrate then take down the United States. This is why he is pushing to bring more Syrian “refugees” into our country despite the objections of 34 governors. He calls them refugees only to accomplish his own purposes. He even accuses his opponents of not upholding our nation’s values. As usual, his statements are just a smokescreen to hide his true intentions. Obama cares nothing about America’s values or the concerns of our people because he is on a mission to destroy us. He is sent from hell. If Obama was truly just trying to help refugees, there are lots of ways he could do that without endangering American citizens. For example, Canada recently implemented a plan to only accept women, children, and whole families coming from Syria. They refuse to accept any single males. That simple policy could easily eliminate much of the Islamic threat, if only we wanted to eliminate the threat, but Obama wants the single males here because he wants the acts of terror they are willing to carry out. Meanwhile, very few churches are willing to talk about these things, which is why very few Christians are aware of what is happening. It makes me wonder whose side many pastors are on, but thank God for a righteous remnant that is awake and listening to what God is saying. Appearing as a guest on the Jim Bakker Show, Glenda Jackson shared some amazing insights God revealed to her about what Obama is now doing in the White House, meeting with Muslims and making plans for our destruction. Their plan is to launch terrorist attacks throughout the nation to give Obama an excuse to declare martial law, which then gives him an excuse to “postpone” the 2016 elections so he can remain in office. And he gave me his name. And many that are supposedly, supposed to be, God’s people voted for him. Well, you are supposed to know who labors among you. That means even in the White House. And He told me he is going to win two terms. I was telling this to Sid Roth and he said, “I just don’t believe he is going to get in a second term.” And Ralph Wilkerson told me the same thing. And I asked why. And they said because all of the major prophets, the big prophets, have prophesied the other guy (the other candidate) is coming in. I said, “Well I haven’t been talking to Mickey Mouse. I talked to God.” And I said, “I don’t care.” And I am not putting them down. And when the election came, we know who won. But Obama won. It was like he came out of nowhere. He just appeared out of nowhere. He decreed it in Baltimore. I went to Baltimore before it (the riots) ever happened. I prophesied in their church that the Muslims were going to stir their youth up to fight against authority, to go against the law shooting one another, but it was going to be the Muslims that would do it. It was going to intensify and they were going to go from state to state to state. And that is how it has been. Watch and it will be in another state. That many cops don’t shoot that many kids and that many kids don’t get mad at cops. It has never happened before. People cannot see it is the undercover work of the devil behind it. So Obama came out and said martial law (in Baltimore). God said the reason they were going to do it this way is for two reasons. First of all, it is going to last until 2016. They are going to keep doing it so it (martial law) will be in force during the elections. Number two, people are going to accept it (martial law) because they are going to feel safe. They will say, “Well this will keep riots down. We feel safer if the martial law is here with us.” But the purpose is not to make us safe or anything. That is the undercover work, sneaky work, of the devil and his men. God showed me in another vision what they want to do. I saw them in the White House talking, and our President, how they go and take over nations, they bring the economy down to nothing, so you have to depend on them. Martial law is going to intensify until it just takes over the entire nation of America. That is what it is going to do. Martial law has always brought down an economy. People don’t realize when it is in a country and it starts going big. The economy falls. The video of her appearance on the Jim Bakker Show is shown at the bottom of this post. Thanks to Geoff Krieger for sharing this video. Islam appears to be the devil’s weapon of choice for taking down our nation. Many warnings have already been posted on this site, so we have lots of confirmations, but we are still getting more. Then last week, I received a disturbing email from a member of the Z3 community, Benjamin Clinger. He shared a warning dream that his wife had along with a report about how President Obama is resettling Syrian Muslims onto an Indian Reservation in his area because it allows him to bypass objections from Congress and state governors. I’ve been contemplating sharing this with you for some time. It concerns the Islamic plot to have church shootings in America. Last year, one Sunday, a thought occurred to me how easy it would be for someone to walk into the church building and shoot up the congregation. I did not share that thought with my wife. I didn’t say a word to her and she doesn’t preoccupy her mind with such things. But some weeks later she had a dream in which just such a thing happened. She said in her dream someone came into the church with a weapon and began shooting the congregation. She said there were two men. Each came through different doors on opposite ends of the building so that the congregation couldn’t escape because they were boxed-in on the left and on the right. By the way, my wife also dreamed she would meet a tall man the morning before she met me at a dance, which was unusual for her. I’m 6’6’’, so I guess I qualify. Then, this year, I read your posts, at least two of them on this subject. One concerned an Islamic plan to have a coordinated attack in churches throughout the country; the other concerned the targeting of young children in Sunday school, which concerns me the most. Last night I shared these things with a couple who believes in dreams and visions. The husband, who is a former fire chief for the city, responded that he will be carrying in church from now on. There are also several city police officers and deputy sheriffs who attend the same building. I’m not sure how to approach the subject with them, or even if I should at all, because there are very few people who I can share these things with. (You can feel them out.) But I’m sure they are aware of the possibility. I’ll be praying they will be in tune to the promptings of the Holy Spirit. Finally, I live in a small town in the Four Corners region (where the borders of Utah, Colorado, Arizona and New Mexico meet). Word is circulating just recently in town that President Obama wants to position a considerable number of Syrian refugees on the Navajo reservation in northern Arizona. The reason being he is somehow able to bypass Congress and negotiate directly with the Navajo nation to do it. That’s the information I have and I hope it’s accurate. Can you see my concern building here? So Benjamin’s wife received a prophetic warning about an Islamic attack on her church while at the same time President Obama is defied the will of the American people to resettle Syrian Muslims onto a Navajo Indian Reservation nearby. Yes Benjamin, I believe you have good reasons to be concerned. I believe God is giving His people advance warnings so we can pray against this evil scheme and spread the word so everyone can take action to prevent it. America is under attack, but in too deep of a sleep to even realize it. Because of our spiritual blindness, we have elected the antichrist to rule over us. Many pastors are even teaching their people Obama was sent by God as a blessing to our nation. That shows how deep the deception is, not only among believers, but among Christian leaders. Thousands of years ago, the prophet Daniel saw this coming. This man of lawlessness would lead an attack against the strongest nation on earth. He would do it with the help of a foreign god. Obama is fulfilling this prophecy by inviting Islamic terrorists into the White House to formulate dark plans under his leadership. Their goal is to destroy our people and our economy. As bad as that is, Obama is not our problem and our guns are not our solution. Our real problem is our broken relationship with God and our only solution is repentance before God in the name of our Lord Jesus Christ, the only true God. I don’t believe we can totally stop Obama or his Muslim accomplices because it has already been prophesied in the scriptures telling us he is going to take action against our nation with their help. However, I believe we can make a big difference regarding how much damage he is able to do. We don’t have to allow these psychopaths to have their way. We can do something about it by repenting from our sins, which then qualifies us to receive God’s promise to heal our land. The effective prayer of a righteous man or woman can accomplish much (James 5:16). Interesting article. Did you ask Ken Peters if Obama or Jared Kushner (is it him like “they” say?? He is trying to bring peace to the middle east) is the anti-christ? He says he knows what he looks like, but I don’t think Obama has the looks or charisma he talks about in the video. The Hollywood version of the antichrist is handsome and charismatic, but there are no scriptures supporting that, so I don’t think that should be our basis for deciding his identity. Ken Peters saw he was very attractive, but my interpretation is he will be supernaturally attractive as people will be inexplicably drawn to him, mesmerized by him, like being under a spell, which is exactly what we see happening with Obama. That kind of attraction is the work of unclean spirits operating in the invisible realm and has nothing to do with physical appearance. The Holy Spirit ‘told me’ in 1998, that ‘they’ would get in through the computers. The black cords looked like snakes. I was warned to get off face book last year. God Bless You All, and Peace in your Spirits. This is a very interesting and thought provoking article. Thought you may be interested in reading it. My opinion is that this article makes sense. The Jewish people would never accept Obama as their Messiah. There is just no way. Thank you again for your work in the Lord. I don’t think this question will ever be answered through our own human reasoning or logic, which often leads us into error and vain arguments. So our only hope is revelation received from God and believed in our heart. This is the rock upon which the Lord builds His church (Matthew 16:13-18). I hope each of us will seek God directly rather than following after any other voices, including mine. I like that approach too because it keeps us together in unity as one body of believers seeking our Father in heaven. Allah is not an unknown god. Daniel speaks about a foreign god of fortresses that even the anti-christ’s fathers did not know, one that he honors with silver and gold. This new god is totally unknown to his ancestors. The bible is interpreted based on the spirit of God. from my upcoming book: The derivatives; God will let his servants know and save them from speculative warfare! Daniel 8:8 gave a glimpse of this offspring of the goat built for world dominion! Revelation 18: 4. The identity can also be googled from immorality and merchants of the world! The man of Sin is coming!! This is just a question. I have no good (real) answer for it. In World War II German 95% of the German men who were 23 years old in (approximately) 1939 (the beginning of the war) were dead or missing at the end of the WWII. And yet there was no great revival in Germany following WWII. So a guess is that since the USA’s founding was in some cases wrapped in Scripture God shows us special mercy after we are taken to the wood shed. (sorry – only just a guess). There are many antichrists but there is only one that is The Antichrist. Revelation tell us the number of the beast is the number of a man. Daniel tells us of a Lion that stands up as a man once the eagle wings are ripped off it (The U.S.A war of Independents from England) This Lion Beast Man will come from England and is seen on his coat of arms. Many countries still swear allegiance(politicians, military officers etc)to this powerful family and they own vast amounts of property throughout the world. Don’t confuse the generals from the upcoming Dictator who will destroy most of the populations of the world. Thanks Martus for sharing your insight ! This resonates in my spirit ! Blessings ! Could it be that the plucked off wings from the Lion Beast in Daniel 7 represent America unable “to fly” after having gone through economic collapses and possibly military setbacks(that are to come in the near future) ? I had never seen it this way before but after reading Martus’ post I am starting to see Daniel 7 in a different light . Thanks again Martus for your post! i recommend looking up “obama hanukkah celebration – frontpagemag” – even the israeli president was there and said nothing. James, I read your post about the pre-wrath rapture and having spent considerable time studying this again went to my bible in prayer for illumination. While I have not experience dreams/visions to date I do believe I have a good grasp of the scriptures. In Revelations 1:6 we are called kings and priests (kings, not kingdom, because it is the masculine version of the greek word according to all the earliest greek manuscripts). Then in Revelations 5:10 before the first seal is opened the 24 elders, which can only be representatives of the church, sang about the Lord making us kings and priests to our God. So, it is clear that the church has representation in Heaven prior to the first seal being opened. Would you agree and if not, why? We are kings and priests to God right now. We are already seated with Him in heavenly places with Christ Jesus. 7 so that in the ages to come He might show the surpassing riches of His grace in kindness toward us in Christ Jesus. Our position in heaven and our identity as kings and priests are both already established. This is who we are. It has nothing to do with the timing of the rapture. Obama is Islam for America. 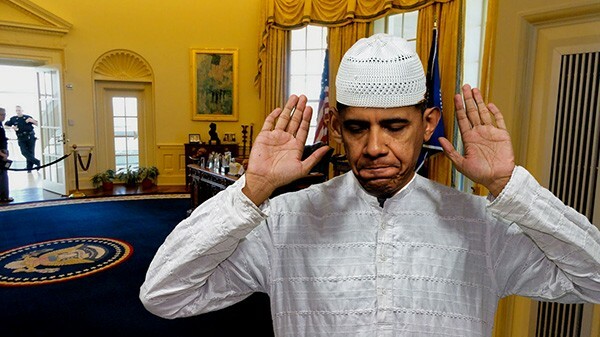 Back in August twenty fourteen at a conference Obama raised his right hand and gave the Islamic victory salute. He is no Christian and does not look the America people. I believe that twenty sixteen will start out as a normal year but will end with the downfall of our beloved country. We are going to lose our freedoms and liberties next year.Hillary Clinton will not being president and no republican will never even be president. We are living in the days of the rise of Islam and the downfall of America. The Islamic frag will rise above the white house. Obama owns the presidency and will remain president until the United Nations crowns him president of the World. Dark days are coming for all of us Christians. Our faith must be strong to be able to survive what lies ahead. America’s downfall will lead to it’s death and destruction in the next five years. Pray and love your families and friends and most of all Jesus Christ our Lord and Savior. Pray for America and Merry Christmas to all of you that love our country. Amen! My vision in 2008, I saw the Statue of Liberty broke in half by a rope around her waist pulling her down, til she toppled in the ocean. I then saw a missile hit the East coast, not sure where it was so fast. That night I had a dream and saw large roman numerals in the air. 2016. The numbers exploded! I said, “I’ve got it Lord” I pray Iam wrong. edna – did you catch his words recently when he claimed that he was the first pan pacific president? he also lays claim to stopping the ebola epidemic. Brian, I didn’t hear that, but that sure baffles me. All his utterances baffle me because they simply don’t make sense. I mean what does that even mean? first pan pacific president? It sounds like little by little he is making his proclamation and declaration known, speaking it, then doing it.